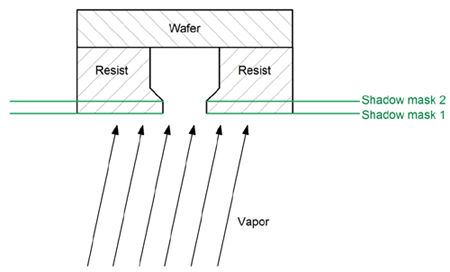 This example shows how the shadow masks can be employed to model the self-shadowing effect in a semiconductor manufacturing process: metallization of wafers by means of the lift-off technique. To achieve good results through the lift-off process, the photoresist, which covers the areas not to be metallized, is often sculpted to have an overhang in its profile. 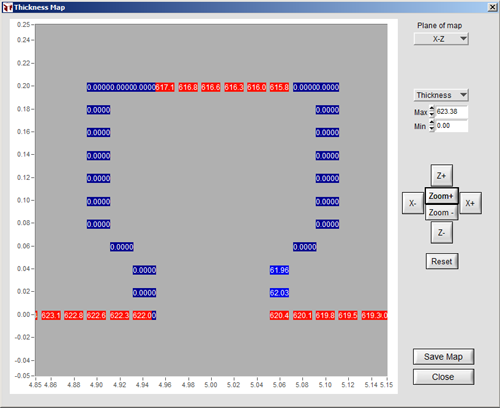 This profile, or any profile of a photoresist, can be modeled in V-Grade 5S; its self-shadowing can be simulated with the help of the shadow-mask function of the program. Here, a 4-inch-diameter wafer on a lift-off dome (spherical) is modeled through a 4-inch-diamater fixture that revolves around the axis. We study a metallization strip (wire) that situates near the edge of the wafer and runs perpendicular to the radius. A numerical array is created to represent the 3D surface with an overhang, as shown below. © 2018 Tin Model LLC. All rights reserved. * As the wire is located near the edge of the 4-inch diameter wafer, the incident angle of the vapor deviates from the surface normal by 5.6 degrees even when the source is centered.